Tritex NDT have successfully transitioned to the new ISO9001:2015 accreditation showing their commitment to quality and customer focus. Tritex NDT were pleased to be invited to sponsor the International Institute of Marine Surveyors first Inland Waterways Training Event. The program was hosted by P & S Marine at their boatyard in Watford and there was a large attendance proving this was a very popular event. The program included a practical welding session as well as surveying a narrow boat with Ultrasonic Thickness Gauges supplied by Tritex NDT. The results were later evaluated and discussed with regard to compiling a report. During the inspection it was found that a number of areas on the vessel had been overplated. 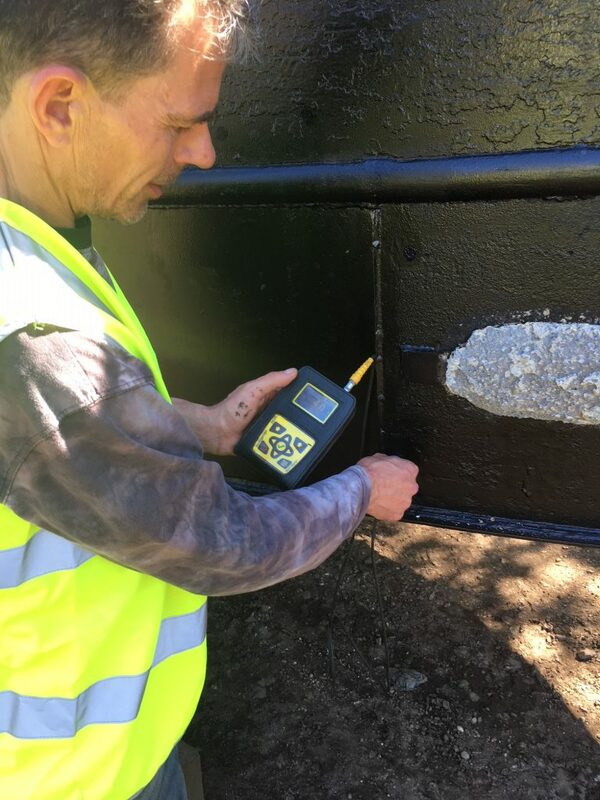 The Multigauge 5600 and Multigauge 5650 Surveyor Thickness gauges gave reliable readings in all areas of the vessel, in some cases through extremely thick coatings. Dorchester based, Tritex NDT have launched a new ultrasonic metal thickness gauge specifically designed for mounting onto drones for high level inspections. The gauge uses multiple echo to completely ignore coatings up to 20mm thick and the single crystal probe ensures accurate readings on curved surfaces, such as storage tanks and pipelines. Remaining metal thickness and corrosion levels can be quickly and more easily checked without the need for scaffolding or rope access. The Multigauge 6000 Drone Ultrasonic Thickness Gauge OEM transmits real time measurements wirelessly up to a distance of 500 metres using its integrated RF transmitter. The readings are displayed and stored on dedicated Communicator software within templates in a grid or string format. Dry couplant membranes reduce the weight further as couplant, and a means to deploy it, are not required. The Multigauge 6000 Drone Ultrasonic Thickness Gauge is supplied as a complete kit for OEM installation onto drones. It accepts an input of 8Vdc – 35Vdc for complete versatility. The probe has Intelligent Probe Recognition (IPR), which automatically adjusts settings in the gauge when connected, resulting in a perfectly matched probe and gauge for enhanced performance. Also, the Automatic Measurement Verification System (AMVS) used with multiple echo ensures only true measurements are displayed, even on the most heavily corroded metals. Tritex NDT is a leading manufacturer of thickness gauges. All gauges are designed and manufactured in the United Kingdom and supplied as complete kits, ready to use, with a 3 year warranty and free annual calibration for the life of the gauge. Tritex NDT give presentation at the International Institute of Marine Surveyors. Jon Sharland recently gave a presentation at the IIMS Large Yacht & Small Craft Athens Training Event via video conferencing. The talk covered the technology behind multiple echo thickness gauges and new developments by Tritex NDT for the inspection of GRP in yachts and small craft. At the end of the technical presentation various gauges were discussed such as the new Multigauge 5650 Surveyor Thickness Gauge for steel and GRP measurements and the Multigauge 5300 GRP Thickness Gauge for just GRP measurement. A group of nearly 20 surveyors met in Greece with additional surveyors joining online for the conference. 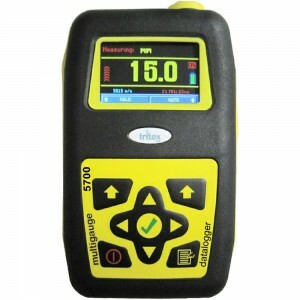 We have launched our new Multigauge 5650 Surveyor thickness gauge. The new gauge, based on the already very popular original Multigauge 5600, has new features specifically designed for marine surveyors but the gauge can be used for other applications as well. The gauge can be used with existing standard soft faced probes for measuring metal thickness through coatings, up to 20mm thick, to give the same high standard of performance as the Multigauge 5600. However, by simply exchanging the probe, the gauge automatically switches to GRP measurement mode which uses single echo. This can be used to assess the condition of GRP when checking for osmosis and delaminations. Either probe can also be used in echo – echo mode, if required, by easily selecting the option from the keypad during measurement. No special probes are needed for echo – echo mode. The gauge has a large modern colour display and an easy to use clear graphic menu. It has been designed in line with Tritex’s concept of Simple, Accurate and Robust. Intuitive menus allow for easy navigation whilst the gauge has added features to improve performance. For metal measurement, the gauge utilises the Multiple Echo technique to ignore coatings up to 20mm thick and just measures the metal substrate. No grinding or removal of the coatings is required, significantly reducing preparation time and ultimately saving both time and money when carrying out inspections. All probes have Intelligent Probe Recognition (IPR), which automatically adjusts settings in the gauge when connected, resulting in a perfectly matched probe and gauge for enhanced performance. Also, the Automatic Measurement Verification System (AMVS) used with multiple echo ensures only true measurements are displayed, even on the most heavily corroded metals. An optional leather case protects the gauge in even the most harsh environments. Only single crystal probes are used, which have a number of advantages when measuring on curved and corroded surfaces. The new Multigauge 5650 is supplied as a complete kit, ready to use, with a 3 year warranty and free calibration for the life of the gauge. Tritex NDT are pleased to announce the launch of the new Multigauge 5700 Datalogger gauge which stores measurements on the gauge in a grid or string format. The results are then transferred to a PC or laptop using a RF transceiver. This means that the gauge can also be used for remote datalogging applications. The gauge has the same features and high level of performance as the Multigauge 5600 thickness gauge, but with the added benefit of being able to store measurements on the gauge. Tritex NDT is pleased to announce a rental partnership agreement with Subsea Technology and Rentals (STR), a multi-disciplinary technology expert. An array of Tritex NDT specialist diver and ROV equipment will now be available to hire or purchase through STR’s Head Office in Great Yarmouth, including The Multigauge 4100 and 4400 Underwater Thickness Gauges. The Multigauge 4100 and 4400 are simple, robust ultrasonic thickness gauges designed to be mounted onto all types of work class ROV’s. There are two models in the range, the Multigauge 4100 which has a depth rating of 3280 feet and the Multigauge 4400 which has a depth rating of 13,123 feet. Both gauges have been designed and built to survive extremely harsh conditions that exist in the offshore and underwater industries worldwide. The gauges use multiple echo which means measurements can be easily taken without the need to remove coatings, up to 0.25”, and the RS422 output makes connection to most ROV’s simple. The popular Multigauge 5600 multiple echo ultrasonic thickness gauge has been chosen by the largest non-nuclear power supply company in the world. GDF Suez compared the Multigauge 5600 against the competition and chose our gauge because of its superior performance through thick coatings and on corroded pipelines. Tritex NDT also secure an order to supply a further 10 gauges to China and 5 x Multigauge 3000 Underwater gauges to Singapore. As part of our on-going commitment to our customers we are pleased to announce our ISO 9001:2008 certification awarded by QAS International. This certification means that we now operate an ISO 9001:2008 certified, quality management system. All areas of the business that impact on our customers have been assessed and approved for a consistent high standard. From the early stages of manufacture of our products right through to the after sales care that we provide; we’ve reviewed our business so that you can be sure of the best levels of customer satisfaction when purchasing a Multigauge ultrasonic thickness gauge.